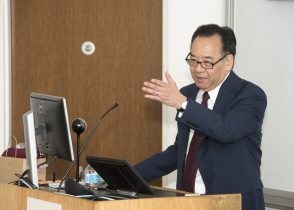 Arno Kumagai,M.D., delivered the 2017 Noback-Burton Lecture on April 28 at the UMKC School of Medicine..
Several trends in health care make the practice of compassionate medicine more difficult, but integrating the humanities into medical education can help produce more-caring physicians, Arno Kumagai, M.D., said at the second annual Noback-Burton Lecture. Rapid technological change, which despite its possible benefits can be hard to keep up with and disruptive. Turning medicine into a commodity and patients into customers. Conveyor belt medicine and measures of “productivity” work against the best care, Kumagai said. The standardization of medical education. Though a wide range of essential skills must be imparted to every student, individuality and fresh and varied ways to see and engage with patients should be nurtured rather than sacrificed. The ubiquity of electronic medical records, leading to typing into a computer crowding out human interaction, especially during a 15-minute conveyor belt style appointment. Especially given these developments, Kumagai said, how do medical schools educate future physicians to best provide patient-centered care? Integrating the humanities into the curriculum is certainly part of the answer, but moreover Kumagai argued for using the many ways that the humanities and art can get people to open their perception and see and know their patients and the world differently. As an example, he said it had built empathy, and shown students the power of other people’s stories, to match medical students with patients with chronic conditions, and have them really get to know those patients. Valuable lessons come from such “deep listening and dialogue,” Kumagai said, and can keep doctors from seeing patients as their illnesses and not whole people. This was the second year for the lecture series, endowed by James Riscoe, M.D. ’75, a member of the school’s third graduating class. Riscoe said he started the event to honor Richardson K. Noback, M.D., the first dean of the School of Medicine, and Jerry Burton, M.D. ’73, a classmate who is recognized as the first graduate of the medical school.